We welcome your feedback, be it a compliment or a complaint. Please send us a message through our Contact page and we will process the information according to processes defined in our Feedback and Complaints Policy below. If you require assistance completing the online contact form, or would rather register your feedback or complaint verbally, please phone (03) 6231 2745. A printable version of the Feedback and Complaints Form is available here and can be completed and returned to us at PO 4649 Bathurst Street PO Hobart TAS 7000 or alternatively can be obtained from our offices. The purpose of this policy is to outline how you can submit feedback or complaints to Autism Tasmania, and how the organisation responds to feedback and complaints. Autism Tasmania welcomes feedback and is committed to ensuring that any complaints received are treated in a fair and consistent manner. We recognise that effective feedback and complaints management is imperative to quality service provision. Service users are encouraged to let us know if they are not satisfied with Autism Tasmania services or have an issue that needs to be resolved. Autism Tasmania management will respond promptly and fairly to all complaints, and work towards a positive resolution. Certain complaints regarding safety, legality or other matters, may need to be reported to the appropriate authorities. 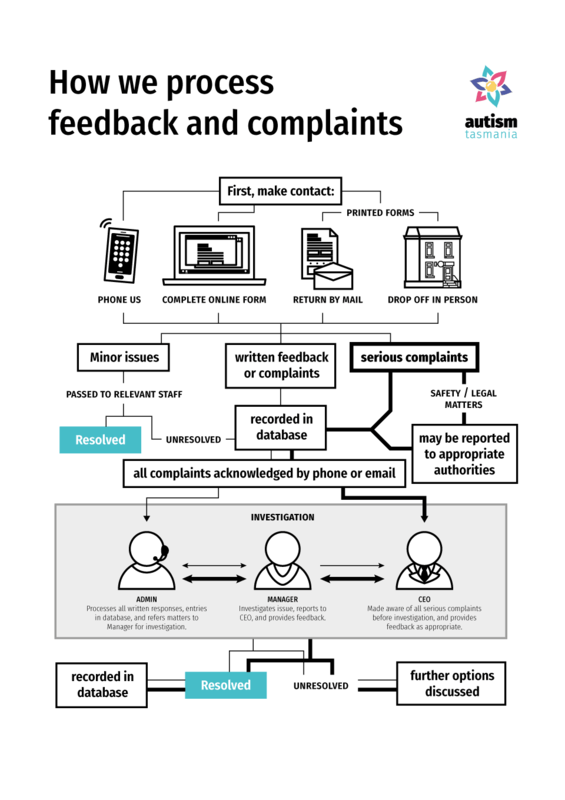 The following procedures are to be implemented to ensure that Autism Tasmania responds appropriately to feedback and complaints. We believe that all feedback, whether positive or negative, presents opportunities for service improvement. When feedback is received by the organisation, it is assessed to determine the appropriate action required. Comments are logged and shared with staff as appropriate. Where suggestions have been made for improvement, these will be passed to the most appropriate staff member to consider and action changes as appropriate. Autism Tasmania is committed to resolving any complaints quickly and fairly. Employees are empowered to resolve minor issues as they arise. Non-serious verbal complaints should be resolved at the frontline in accordance with the principles of this policy and will not be recorded in the database. All written or unresolved telephone/in person complaints will be recorded on the complaints database, maintained by the Administration Officer and referred to an appropriate manager for investigation and resolution. All complaints will be acknowledged promptly and the complainant will be informed either by telephone or email that their complaint has been received and will be investigated. The Administration Officer will undertake all written responses to ensure consistency and completeness, and ensure quality of data recorded in the Complaints Database. The manager investigating the issue will report to the Chief Executive Officer (CEO). The CEO must be consulted regarding any serious complaints prior to investigation. Either the manager or CEO who will provide feedback to the complainant as appropriate. When the complaint is resolved, this will be recorded on the Complaints Database. If the issue is not resolved, information regarding further avenues will be shared with the complainant as appropriate. For example, complaints regarding our National Disability Insurance Agency (NDIA) associated services can be referred to the NDIA for investigation by calling 1800 800 200, visiting one of their offices in person, or visiting www.ndis.gov.au for further information. Complete the ‘feedback and complaints form’ that can be found on the Autism Tasmania website: www.autismtas.org.au and submit online. Print off Form from the website or obtain a Feedback and Complaints Form from us complete and return in person or by mail. Contact Autism Tasmania on (03) 6231 2745 and ask to register feedback or lodge a complaint.